Citizen Interaction Design (CID) partners rising information professionals with Michigan communities to create information tools for twenty-first century citizens. New information tools have transformed many industries in the past several years, but have rarely been applied to interactions between local governments and their citizens. Now, more than ever before, citizenship is dependent on both access to, and participation in creation of information. New information tools could help citizens to engage with their community in constructive, effective ways. And, in the process, those tools would help local government to better enable and support that citizen interaction. 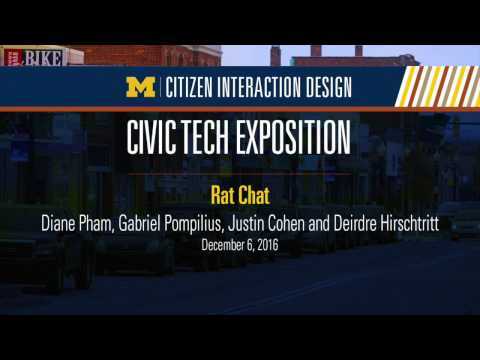 University of Michigan students from all disciplines are invited to take part in the Citizen Interaction Design experience. The program offers School of Information students the opportunity to enroll in SI 538 Citizen Interaction Design Studio, a four-credit interdisciplinary course that engage students in the development of information tools that promote citizen engagement with their local government. Students can also participate in summer internships with local Michigan municipalities, attend speakers on civic engagement topics, attend our bi-annual #micities conference, or work with program leadership to initiate their own civic technology project. When: Opportunities take place throughout the year. Additional information: Voted Best Engagement Opportunity by UMSI students, 4 years running! Though three-year partnerships, CID connects partner communities with University of Michigan student teams through, classes, service projects, internships, and other activities. Together, they develop new information tools that foster civic engagement on a broad range of topics, including local history, public access to government data, police interaction, recycling, vermin control, and many other topics. Novel aspects of Citizen Interaction Design include long-term, year-round partnership with a city to facilitate sustainable projects and dedicated university staff who will manage projects. Where: CID participation takes place on the Ann Arbor campus and in the partner communities. Eligibility and application: we are seeking partnerships with Michigan communities of all sizes and locations. Additional information: Voted Best Engagement Opportunity by Michigan residents, 4 years running! In 2013, the Jackson City Council resolved to become the first Citizen Interaction Design partner community. Jackson is home to Consumers Energy, Michigan’s first state prison, and the Republican party birthplace. As a medium-sized Michigan community with a struggling economy, Jackson has limited resources to invest. However, Jackson recognized the value of the partnership in reimagining the relationship between government and citizens. Over the course of the three-year partnership agreement, nearly 100 students from UMSI partnered with city departments and community organizations to complete 25 projects, including the first open data ordinance in Michigan, an anonymous texting service for police tips, and an innovative information campaign for downtown construction. During the partnership, Jackson also implemented a new web presence and hired its first information officer. In 2015, Jackson was recognized for its role in CID by the Michigan Municipal League, winning the “Attracting Talent” category for the MML’s Community Excellence Award. Child Immunization (W14) Students developed a social media plan at the Jackson County Health Department to improve child immunization rates. The final product included a planning report and evaluation metrics. Connecting with Citizens (W14) City Hall requested guidance in effectively sharing information relevant to citizens through a newly implemented communications tool, JacksonConnect. The recommendations focused on clarifying internal processes and policies, as well as explaining to staff the value and strategy for using Jackson Connect in their work. Distressed Property Report (W14, S14, F14, S15) Over the course of 18 months, multiple student teams worked on a website that explains the condemnation and demolition process for vacant and blighted structures, including the appeals process. The site includes a map of all condemned and demolished structures linked to information on contributing condition of the structures, the costs of demolition and the current status of the project. Digital Cemeteries Archive (W14) Students helped the cemeteries department establish a process to digitize and preserve fragile cemetery records and created a History Hunt activity pamphlet to increase public exposure to the cemeteries. DigDowntown (W14, S14, F14, S15) The City requested help with informing the public about the progress of a major downtown construction project and invited them to learn about the community infrastructure through the construction process. Over multiple semesters, students created a website, newsletter, and media campaign describing the need for the project, the work plan and timeline, and the resulting downtown streetscape. They further developed a procedure for applying these tools to any construction project moving forward. Maps and Apps (W14) Working with the GIS department, these students found new ways for the city to share their plethora of GIS data with the community in meaningful ways. The team digitized school bus routes and designed a web interface for the public to explore the city’s collection of GIS maps. Master Plan Public Involvement (W14) This team worked with planning consultants to invent new ways to engage the community in the development of a master plan, which establishes the long-term goals of the city. Their product was an infographic and engagement activity that they facilitated at public meetings about updating the city’s master plan. Open Data Policy (W14, F14) Students were asked to develop policy infrastructure to support improved public access to government data. Teams in two semesters worked to establish the policy framework, practical tools, and sustainable processes required to implement a successful open data program in the City of Jackson. Jackson passed the first Open Data ordinance in Michigan, written by these students. Tips by Text (W14) Students worked with the Jackson Police Department to improve communication between officers and the community, especially regarding active cases. The students used Twillio to create a system for anonymous reporting of crime tips via text. They also developed a communication campaign for the tool that utilized trusted relationship in the community. Where is the Bus When? (W14) Students were tasked with improving the experience of riding transit through wayfinding and scheduling information tools. After extensive user research, the team recognized that high-tech tools would not be effective. They designed improved bus route maps focusing on popular destinations that could be posted at bus stops. ArtSmart (F14) The Jackson Arts Commission asked students how an information tool could connect the public with public art. The students developed an interactive experience guided by a combination of online trivia and social media posting to learn about and find public art pieces in Jackson. Living History (F14) The student team worked with the historic district commission to apply an information solution to engage owners of historic homes in the process of preserving historic districts. They found that most people didn’t know whether they lived in a historic district. Their idea: A simple web tool to find out if you live in a district, and a magnet with useful information mailed to all houses in the districts. Step by Step (F14) Working with staff of a wellness initiative, students aimed to encourage Jackson residents to use recreational space and be active every day. The Team designed a prototype of a mobile application that combined social sharing of activity with a map of popular places to be active in Jackson. Welcome to Jackson (F14, F15) City council asked students how an information tool could facilitate a more welcoming experience for people moving into the City of Jackson. One team of students designed a list-sharing app of favorite places, events, and experiences. Another team addressed the architecture of the city website to create a portal for new residents to find all relevant information. What’s at the Farmers Market? (F14) The goal of this project was to make it easier for residents to know what is at the farmers market. The student team recognized a general lack of awareness in the public and created a volunteering platform to facilitate increased engagement and interaction with the market. Community Perception and Socio-economic Status (S15) A CID Summer Fellow completed a user experience research project to investigate the mismatch of perception and reality of events and activities in Jackson. The study looks at the influence of demographic factors on residents perception of events and activities in Jackson. Summer Team Overview (S15) This is an overview of the projects completed by three CID Summer Fellows in Jackson in 2015. Neighborhood Watch (F15) Students worked with a neighborhood watch group to improve the opportunities for neighbors to work together to build community and reduce crime in their neighborhood. Recognizing the limited resources and capacity of neighborhood groups, the team focused on simple tools to describe the goals and mission of the group, and connected Facebook sharing with a physical bulletin board. Snow Squad (F15) Walking and biking advocates asked for help developing information solutions to increase rates of sidewalk snow shoveling in Jackson. The student team responded with a website for reporting, tracking and contributing to sidewalk clearing needs in the community. I Can’t Prove I’m Me (F15) Working with the Interfaith Shelter, this team improved the opportunities for homeless people to acquire various forms of identification. The project centered on information-sharing across multiple organizations that interface with the homeless population, so the team created a shared spreadsheet and policy that helps recreate a legal identity for people who have lost theirs. Breadcrumbs Nature Guide (F15) A nature conservancy was seeking new ways for sight-limited visitors to experience the nature trails at the Dahlem Center. The student team developed a Bluetooth beacon system that would guide visitors through a trail system and provide additional auditory information via a mobile app. Access for All (F15) Students worked with disAbility Connections to build a tool that helps people with disabilities choose and plan visits to restaurants and retailers based on the accessibility of their buildings. The website now operates in three counties with plans to expand to more. Business Connect (F15) City staff presented a challenge to simplify the process of starting a business in Jackson. The student team created a prototype of a centralized online platform that guides entrepreneurs through the requirements, applications and fees related to starting a business. Making History (F15) This student team created an information product that facilitates public participation in creating and identifying the history that we are making today through engagement with a local history museum. As a simple and sustainable solution, postcards with pictures of museum artifacts were sent to the community. The responses were then posted to the museum’s Pinterest page as an online gallery of the community’s connection to their past. Rental Check (S16) The team tapped into existing data from the rental inspection program to help renters find better places to live. The resulting website informs prospective renters about recent inspection violation counts and types, timeframe to correct the issue, and other properties held by the owner. Ferndale became a Citizen Interaction Design partner in the spring of 2016. Ferndale is an inner-ring suburb of Detroit at the intersection of Woodward and Nine Mile. The city is well-known for a hip and growing restaurant and bar scene, a strong LGBTQ community, and the Dream Cruise of classic cars. Ferndalians’ love of their community is expressed loudly and often, and frequently in reference to the unique quirks that they consider #FerndaleNormal. The City of Ferndale aims to build on this strong sense of community, and support opportunities for citizens to engage in the decisions and activities that make their city great. CID kicked off the Ferndale engagement with a study of the customer interaction via the phone system through a summer internship. Student projects in the fall of 2016 addressed bike safety, recycling, vermin reports, and leaf collection. We look forward to applying our experience gained in Jackson,MI creating new solutions and facilitating great opportunities for citizens to engage in their Ferndale government and community. Phone Data Analysis (S16) The city knew that their phone system was not optimized for good customer service, so they asked for help. Through investigation and analysis of phone system data, a CID Summer Fellow recommended changes to the City Hall phone system that would improve the citizen phone experience. Leaf Collection (F16) Students were tasked with finding an information solution to make fall leaf collection better for the citizen. Through user research, they discovered that knowing when leaves were to be picked up was the biggest challenge for citizens. A new widget on the city website reports all pick-up days when an address is entered. Ferndale Moves (F16) City staff recognized a challenge with safety and awareness issues around use and mis-use of Ferndale bike lanes. The team discovered that an existing online service subscription at the city could be adapted to provide a simple tool for reporting near misses and points of concern for bikers. Recycling (F16) Students worked with city staff to increase recycling activity by residents. Their research indicated that city parks were a space where recycling rates had room for improvement, so they designed the Adopt-A-Park program, in which volunteers claim a park, lead recycling efforts, and report recycling increases. Rat Chat (F16) The team was tasked with creating a way for Ferndale citizens to contribute to solutions for vermin control. 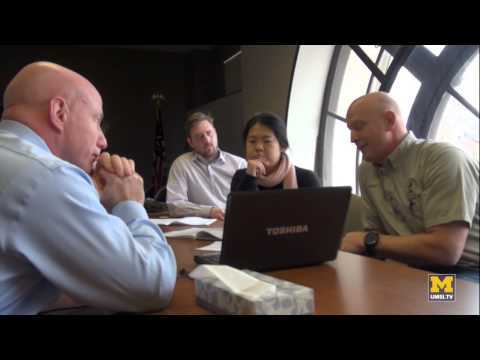 Their solution, Rat Chat, offered a simple, text-based way to report rat information in a format that improved response efficiency of city staff. Police Data Initiative (W17) Students worked with the Ferndale Police Department and community members to implement an open data initiative in the city and increase trust and transparency between the community and the police. By using User-Centered Design Methods, the CID team was able to establish a best-practices process and implementation, including a model dataset for release, and establishing a community open data task force to identify future datasets for release. Ferndale 411: Parking Deck (W17) A new parking deck project in Ferndale required increased communication with concerned residents and business owners. The student team developed an interactive infographic that shares information about the parking deck project, based on user interviews that revealed a lack of public understanding of basic facts about the project. Curbside Calendar (W17) Building off of the progress of the leaf collection team, these students looked for ways to share additional service information with residents. They built a calendar widget that lists pick-up dates for leaves, recycling, and garbage service based on a submitted address. Docubot for Public Records (W17) The City Clerk tasked this student team with increasing public access to extensive public records, possibly through digitization. Through user research, the team identified a more basic problem, that the community wasn’t aware of the role and resources of the City Clerk. Docubot is a Facebook chatbot that introduces people to the information available in the clerk’s office and helps navigate the search for specific records. Ferndale Business ResourceMap (W17) Students worked in partnership with the City of Ferndale’s Community and Economic Development Department to develop the Ferndale ResourceMap, an online self-assessment tool capable of improving the business developments process. From insight gathered from interviews, mapping, and competitor analysis, they designed the Ferndale ResourceMap to be an online self-assessment tool on the city website.